The 360 team is finally back in NY after spending the week in St. Petersburg, FL. My favorite part of traveling is getting the chance to work with Anderson outside of the office. Seeing him so relaxed in such a hectic atmosphere makes my job easier, and a lot more fun. The candidates all seemed happy to meet him, and really responded well to him both before and during the show. After the debate was over, he immediately started 360, but the commercial breaks were spent talking to the wives of several of the candidates and some audience members. Once the show wrapped, he took pictures with the audience members who stayed to watch 360 in action. I always enjoy traveling for the show, and really get a kick out of how crazy things can be on the road. But working with Anderson on a political stage such as a debate really makes me appreciate what I get to do for a living. Keeping on the political beat, be sure to tune in Monday night when Anderson spends a day on the campaign trail with former Arkansas Gov. Mike Huckabee. If you were watching the debate last night, you know the Governor is sure to have some good responses to Anderson's questions. St. Petersburg, Florida (CNN) -- The final countdown has begun. 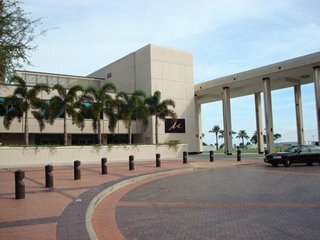 Members of the audience have started to arrive at the Mahaffey Theater at the Progress Energy Center in St. Petersburg. Hundreds of audience members are waiting to pass through the metal detectors and take their seats inside the debate hall. Outside the building, in the CNN Election Express Bus, the mood is serious as Anderson goes through the questions and his follow-ups. It's not lost on any of us that eight men taking the stage tonight are running to become the leader of the free world. In our mobile control room, the director and her team are making sure everything is perfect with the set, cameras, lights and microphones. In live television, everything has to go like clockwork. When the candidates and their entourages arrive they will go directly to their green rooms for any last minute preparations. Then, at 8 pm eastern time, they will join Anderson on stage to answer your questions. As these things go, the candidates hope for a win, will settle for a draw - but a loss at this point, with voting in Iowa and New Hampshire early next month, could be a major setback. It promises to be an exciting night. We'll have complete reaction and analysis immediately following the debate on a special edition of AC 360. See you at 8pm. The clock is ticking. 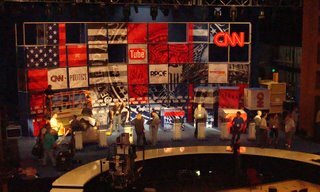 As the level of anticipation for tomorrow night's CNN/YouTube Republican Presidential Debate increases, so does the volume of the discussion among those of us (we've been called a "cabal") going over possible questions inside the fortress-like CNN Election Express bus. Some of the submissions are near shoo-ins while others are still up in the air and may wind up being game time decisions. Anderson will arrive at the bus shortly and has a busy night ahead of him. 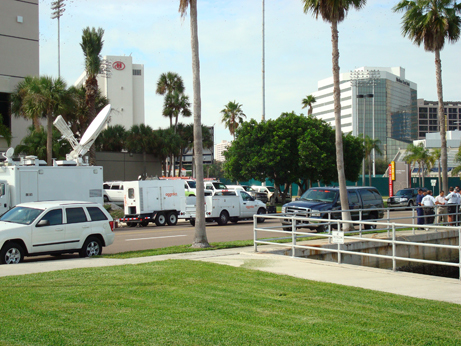 In addition to preparing for the debate, he also will be anchoring tonight's 360 broadcast from here in St. Pete. He'll be taking you inside the debate hall as well as showing you more of the questions that were submitted. Meantime, the candidates and their teams are descending on the area as slowly, but surely, the eyes of Republicans everywhere focus on the west coast of Florida. St.Petersburg, Florida (CNN) --- The deadline has come and gone. All told, we received just under 5,000 questions submitted via YouTube for Wednesday night's Republican Presidential Debate. That's compared to almost 3,000 questions for the Democratic Debate back in July. Many are serious and straightforward, others are intriguing and clever, a number of them are rather humorous and -- let's face it -- some are just plain weird. 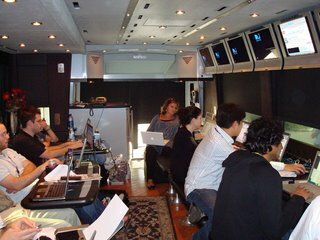 We're hunkered down going over the submissions in the state-of-the-art (and, thankfully, air conditioned) CNN Election Express Bus outside the Mahaffey Theater at the University of South Florida. 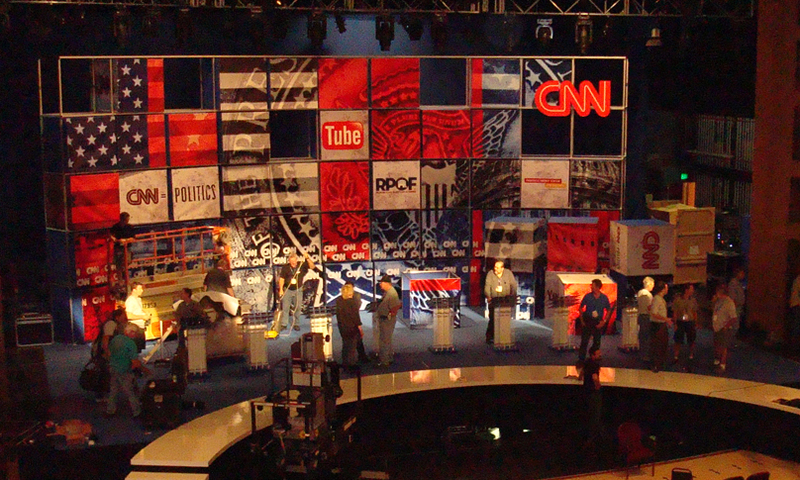 Inside, crews are working feverishly to finish construction on what I must say is a very cool stage from which the eight candidates will answer your questions. Meantime, other news media have started to arrive, demonstrators have set up camp on the street outside, and security is being ratcheted up. Anderson arrives tomorrow and the candidates arrive on Wednesday. In the rest of the country it might be beginning to look a lot like Christmas, but here in St. Petersburg, it's beginning to look a lot like debate time.